Due to the on-going Investigation Maintenance Works on Third Mainland, a portion of the Carter Bridge that needs urgent work has been discovered. Kindly repair Carter Bridge. This is from Oyingbo en route to Idumota/CMS. I have not taken dis route in years but due to 3rd Mainland Bridge closure that was why I was able to snap this. Pls, fix it. 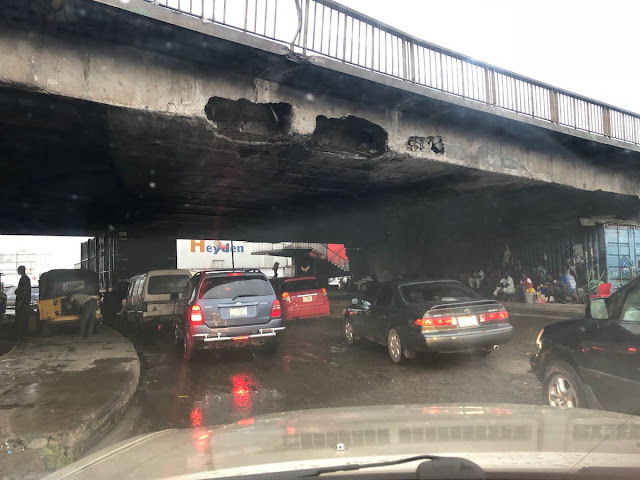 Federal Ministry of Power, Works, And Housing wishes to assure the good people of Lagos that Experts from the Ministry have examined the damaged part of Iddo Overhead Bridge (not Carter Bridge as mentioned in social media posts). There is no cause for alarm as the cracks caused by the constant abuse of the Bridge has not affected its structural integrity and will be fixed in due course. Meanwhile, Nairanaijanews got a clip which shows men from the ministry and officials who came to inspect the bridge and may likely start work on it as soon as possible.